The Radio Queen is one of our best selling vintage kits. It makes a good step up to a slightly larger model from Junior 60 size designs but still retains the simplicity of building that makes the Junior 60 and Super 60 so popular. The Radio Queen has a flat bottom wing section which means it can mangae breezy or windy weather and given enough power and plenty of down elevator it can be flown nose into wind on windy days. 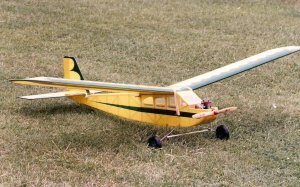 A good trick that always raises a round of applause from club mates is to allow the model to 'fly backwards' by keeping the model nose down and pointing into wind then easing back on the power until it is indeed tracking across the ground - backwards! The Radio Queen kit includes pre cut wing ribs, tip shapes and formers, balsa strip, sheet and block parts, undercarriage wire, glazing, hardwoods and dowel, a hardware pack and full size plans. Everything needed to build the basic airframe of the model. Sending kits overseas. We use Parcel Force for our overseas deliveries. Parcel Force cover most worldwide destinations but some restrictions may apply to certain countries. Please see ‘shipping conditions’ for further details or email us for further help.